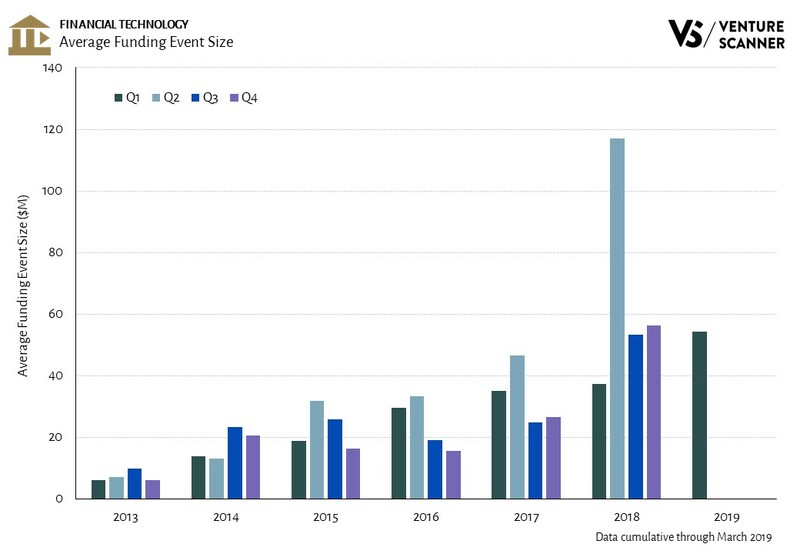 For this quarter’s funding analysis, let’s examine how average funding event sizes in the financial technology (fintech) sector are evolving. The graphic below shows the fintech average funding event size over time by quarter. 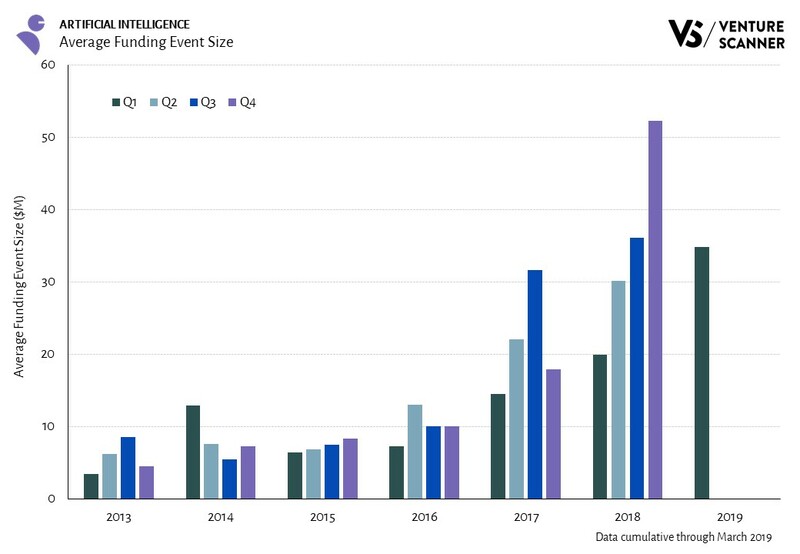 As the graphic demonstrates, fintech average funding event size in Q1 2019 was at $54M, which dipped by 4% from the $56M last quarter. The average funding size has been on a strong upward trend, with the average funding size last quarter around 4 times larger than it was 5 years ago. The top three funding events in Q1 2019 include a $1.3B round from Sea, a $750M round from CommonBond, and a $440M round from OakNorth. To learn more about our complete financial technology dynamic report, visit us at www.venturescanner.com or contact us at info@venturescanner.com. This blog post examines the different components of the health technology ecosystem. We will illustrate what the categories of innovation are and which categories have the most companies. We will also compare the categories in terms of their funding and maturity. Let’s start off by looking at the Sector Map. We have classified 2,334 health technology startups into 22 categories. They have raised $88B from 3,843 investors. The Sector Map highlights the number of companies in each category. It also shows a random sampling of companies in each category. We see that Digital Medical Devices is the largest category with 324 companies. These companies build IT-enabled medical and diagnostic devices for doctors. These devices include detection equipment, monitoring equipment, and surgical tools. Some example companies include Signostics, MediBeacon, Stimwave, and AliveCor. 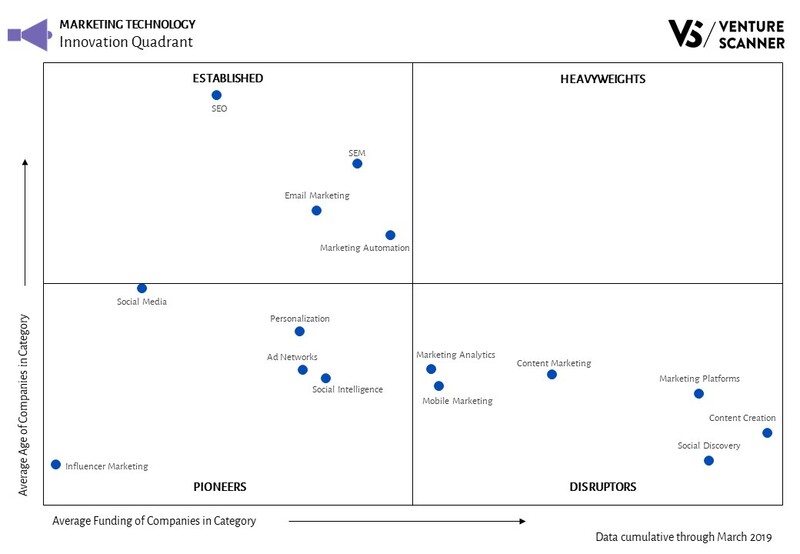 Our Innovation Quadrant divides the health technology categories into four different quadrants. 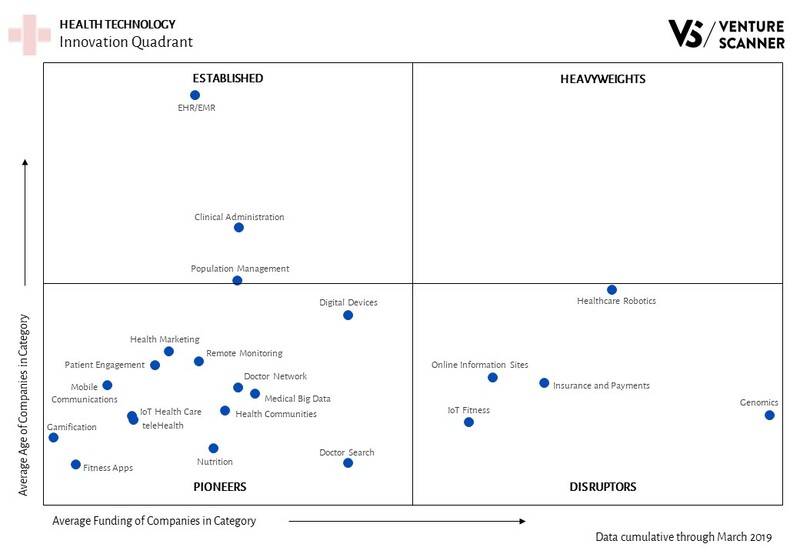 We see that the Pioneers quadrant has the most number of health technology categories at 13, accounting for 59% of all health technology categories. The EHR/EMR category has the highest average age, and the Genomics category has the highest average funding. On the other hand, the Fitness Apps and the Gamification categories are low on both average funding and age. Here is our Q1 2019 summary report on the internet of things startup sector. The following report includes a sector overview and recent activity. To learn more about our complete internet of things dynamic report, visit us at www.venturescanner.com or contact us at info@venturescanner.com. Let’s start off by looking at the Sector Map. We have classified 1,833 martech startups into 15 categories. They have raised $44B from 2,417 investors. The Sector Map highlights the number of companies in each category. It also shows a random sampling of companies in each category. To learn more about our complete marketing technology dynamic report, visit us at www.venturescanner.com or contact us at info@venturescanner.com. The internet of things (IoT) industry has seen 3,580 investors and $79B total all time funding. 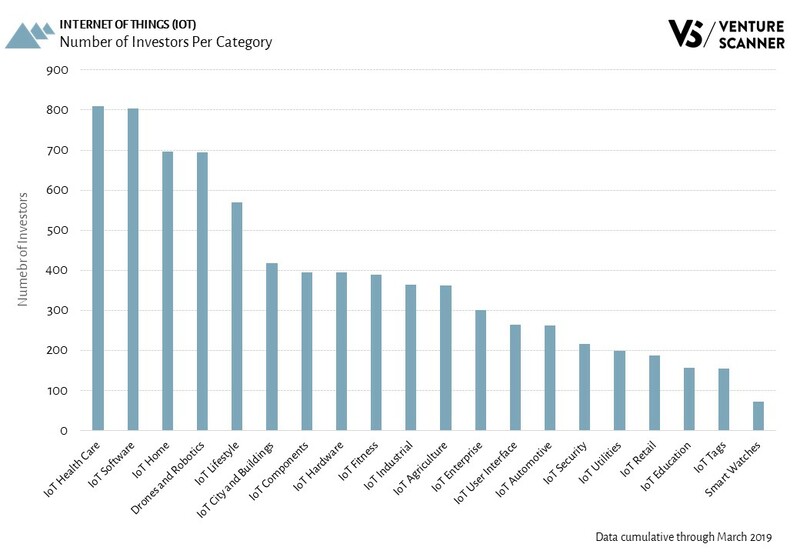 Let’s analyze which IoT categories have the most number of investors actively financing the startups. The graphic below highlights IoT categories based on the number of investors in each category. As the graphic demonstrates, IoT Health Care has the highest number of investors at 810, with IoT Software Platforms right behind at 803. In addition, the average number of investors across all IoT categories is 385. IoT Health Care companies create connected devices that track health metrics or help improve health well-being. IoT Software Platform companies build backend software systems that provide infrastructure for IoT companies. Here is our Q1 2019 summary report on the financial technology startup sector. The following report includes a sector overview and recent activity.